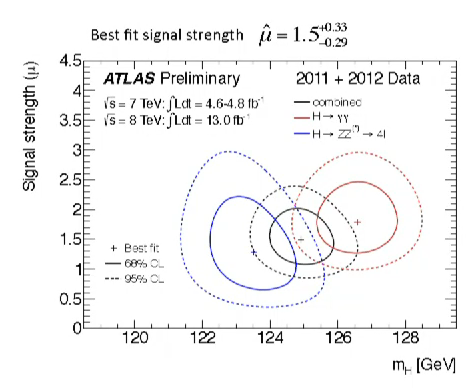 For the annual December CERN council meeting the ATLAS experiment provided an update of the Higgs searches in the γγ and ZZ→4 leptons channels. The most interesting thing about the HCP update a month ago was why these most sensitive channels were *not* updated (also CMS chose not to update γγ). Now we can see why. 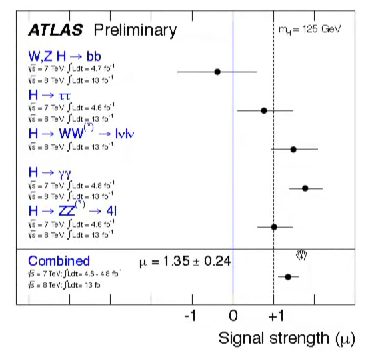 The ATLAS analyses in these channels return the best fit Higgs masses that differ by more than 3 GeV: 123.5 GeV for ZZ and 126.6 GeV for γγ, which is much more than the estimated resolution of about 1 GeV. The tension between these 2 results is estimated to be 2.7σ. Apparently, ATLAS used this last month to search for the systematic errors that might be responsible for the discrepancy but, having found nothing, they decided to go public. One may be tempted to interpret the twin peaks as 2 separate Higgs-like particles. However in this case they most likely signal a systematic problem rather than interesting physics. First, it would be quite a coincidence to have two Higgs particles so close in mass (I'm not aware of a symmetry that could ensure it). Even if the coincidence occurs, it would be highly unusual that one Higgs decays dominantly to ZZ and the other dominantly to γγ, each mimicking pretty well the standard Higgs rate in the respective channel. Finally, and most importantly, CMS does not see anything like that; actually their measurements give a reverse picture. In the ZZ→4l channel CMS measures mh=126.2±0.6 GeV, above (but well within the resolution) the best fit mass they find in the γγ channel which is 125.1±0.7 GeV GeV. That makes us certain that down-to-earth reasons are responsible for the double vision in ATLAS, the likely cause being an ECAL calibration error, an unlucky background fluctuation, or alcohol abuse. 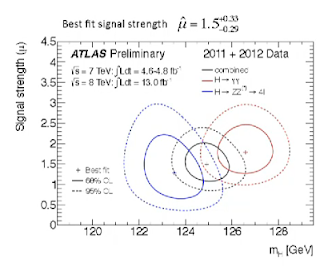 One more news today is that ATLAS also began studying some differential observables related to the Higgs boson, which usually goes by the name of "spin determination". 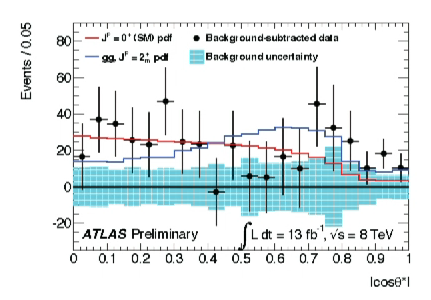 In particular, they looked at the production and decay angles in the ZZ→4l channel (similar to what CMS showed at HCP) and the Higgs production angle in the γγ channel (first measurement of this kind). For spin zero the production angle should be isotropic (at the parton level, in the center-of-mass frame of the collision) while for higher spins some directions with respect to the beam axis could be preferred. Not surprisingly, the measured Higgs production angle is perfectly consistent with the zero spin hypothesis (ATLAS also quotes spin-2 being disfavored at 90% confidence level, although in reality they disfavor a particular spin-2 benchmark model). Here are the links to the ATLAS diphoton, ZZ, and combination notes. Puzzling! Could recalibration issues be resolved purely by data analysis, or does is require actual fixing in the detectors? "let's wait for CMS to come out with what they have in the diphoton channel"
any idea when this will occur? Thanks. Not saying it's responsible --- just that I like it. At this point it's hard to say. My best guess is that the background in the 4-lepton channel is somewhat underestimated and they happened to have a fluke that pulled the mass downward. In that case it would just be an analysis problem that will be fixed with more data. > any idea when this will occur? Are the slides online somewhere? Could you say how tall the two peaks are? No slides yet, but the conf notes should be out today. 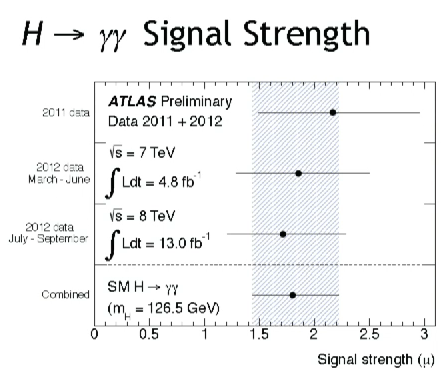 The signal is 4.1 sigma in ZZ and 6.1 in diphoton, so both peaks are significant on its own. 2.7 (2.3) sigma difference in the masses is described as "consistency at the 2.7 sigma level"
91% CL (1.6 or so sigma) disagreement with the spin 2 hypothesis is described as "spin 2 excluded at the 91% level"
One should keep in mind that many models, e.g. the NMSSM, have the possibility of two nearly degenerate higgs bosons, h1 and h2. One can easily find parameters yielding mh1=123.5 and mh2=126.6 (at least roughly) and h1 can have higher ZZ rate than h2 and h2 can have higher gamma gamma rate than h1. See arXiv:1207.1545. Never underestimate the power of the NMMSM parameter space. Clearly there's a parallel universe fault line running through CERN. In one universe, the Higgs is 123 and in the other it's 126. Maybe the Higgs mass changes with the amount of particles that it holds together? Don't drink and drive LHC! Would make a nice T-shirt. the accumulated luminosity is now much higher than in this analysis, and hopefully the resulting data will be released at Moriond. one shouldn't really spend too much time looking at these 2-ish sigma flukes... if the twin peaks and the diphoton excess are for real, they'll be waiting for us in March. any rumour as to why there is no update from CMS? Like the idea of the parallel universe fault line. Has anyone looked through the CMS roster for a Fauxbiola? `It's not obvious that the world is worth understanding''. It's beginning to seem that he may be right. For once. Just a minute, are there proofs that he said so? I don't expect much better from him anymore, but this is really tragical. Could you give some reference?